Spacious, bright family home located in Madison School District. 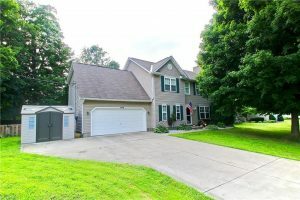 This 4 bedroom 2.5 bath colonial has plenty of room for everyone to enjoy. First floor renovation was completed in spring of 2018. New paint, flooring, trim, ceiling fans and first floor powder room. Beautiful french doors with built in blinds lead to huge fenced in backyard. Large eat in kitchen features an island and two pantries. Upstairs you will enjoy four generous sized bedrooms. The master features an on suite bathroom and his and her closets. Laundry is convienently located on the second floor as well. In the oversized two car garage you will find plenty of storage as well as a built in work bench. Other updates include a new storage shed (2016) and new furnace (2015).